Atlanta–Fulton County Stadium, often referred to as Fulton County Stadium and originally named Atlanta Stadium, was a multi-purpose stadium in the southeastern United States, located in Atlanta. It was built to attract a Major League Baseball team and in 1966 succeeded when the Milwaukee Braves relocated from Wisconsin. The Braves and expansion Atlanta Falcons of the National Football League shared the venue for 26 years, until the Falcons moved into the newly completed Georgia Dome in 1992. The Braves continued to play at the stadium for another five years, then moved into Turner Field in 1997, the converted Centennial Olympic Stadium built for the previous year's Summer Olympics. During his 1961 campaign for mayor of Atlanta, Ivan Allen, Jr. promised to build a sports facility to attract a Major League Baseball team. After winning office, Allen chose a 47-acre (19 ha) plot in the Washington–Rawson neighborhood for the building site, citing its proximity to the state capitol, downtown businesses, and major highways. Allen and The Atlanta Journal sports editor Furman Bisher attempted to persuade Charlie Finley, owner of the Kansas City Athletics, to move his team to Atlanta. Finley was receptive and began discussing stadium design plans with Allen. However, the deal ended in July 1963 when the American League did not approve the move. The new stadium was built on the site of the cleared Washington–Rawson neighborhood, which a half-century before had been a wealthy neighborhood home to Georgia's governor, among others, but which by the 1960s had fallen on hard times. Forty-seven dignitaries took part in a groundbreaking ceremony on April 15, 1964, and that November, the Braves signed a 25-year agreement to play there, beginning in 1966. Construction was completed on April 9, 1965, for $18 million, and that night the Milwaukee Braves and Detroit Tigers played an exhibition game in the stadium. During that year the International League's Atlanta Crackers, whose previous home had been Ponce de Leon Park, played their final season in Atlanta Stadium. In 1966, both the National League's transplanted Braves and the National Football League's Atlanta Falcons, an expansion team, began to use the facilities. In 1967, the Atlanta Chiefs of the National Professional Soccer League (re-formed as the North American Soccer League in 1968) began the first of five seasons played at the stadium. The venue hosted the second match of the NASL Final 1968 and two matches of the NASL Final 1971. 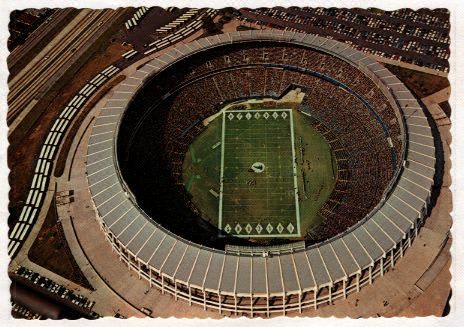 On February 11, 1975, the stadium's name was changed to the compound Atlanta–Fulton County Stadium after the county threatened to withdraw its financial support. However, the official website of the Atlanta Braves maintains that the name change occurred after Ted Turner purchased the team in 1976. The Falcons moved to the Georgia Dome in 1992, while the Braves had to wait until the Olympic Stadium from the 1996 Summer Olympics was transformed into Turner Field to move out at the beginning of the 1997 season. The stadium sat 60,606 for football and 52,007 for baseball. The baseball competition for the 1996 Summer Olympics was held at Atlanta–Fulton County Stadium while the Braves were on a three-week road trip. The site where Atlanta–Fulton County Stadium once stood is now a parking lot. The fence and wall display in the center of the picture commemorates the spot at which Hank Aaron's 715th home run landed on April 8, 1974. Following the Olympics and the 1996 World Series, Fulton County commissioner, Marvin S. Arrington, Sr., had a plan to save the stadium and use it as a professional soccer arena and share the parking facilities between it and Turner Field but he was unable to push it through. Between 1996 and 1997, the inside of the stadium was demolished. The stadium was imploded on August 2, 1997; the remains were later removed and demolished. A parking lot, built for Turner Field now stands on the site, with an outline of the old stadium built in. The monument that marked the landing point of Hank Aaron's historic 715th home run stands in the same place it did when the stadium was on the site. Upon the Atlanta Braves' move to SunTrust Park in suburban Cobb County after the 2016 season, the stadium site and the adjacent Turner Field were purchased by Georgia State University in 2016, with final approval from the Board of Regents of the University System of Georgia on November 9 of that year. Georgia State will build a new park for its baseball team within the footprint of Atlanta–Fulton County Stadium, while Turner Field was renovated into Georgia State's new football stadium. On July 25, 1972 the stadium hosted the Major League Baseball All-Star Game. Hank Aaron hit a home run during the game, and the National League won it, 4–3, in 10 innings. During a series between the Braves and the San Diego Padres, one game spawned several brawls between the two teams. On August 12, 1984, Braves pitcher Pascual Pérez hit the Padres' Alan Wiggins with a pitch; Wiggins did not charge the mound, but the Padres vowed revenge on Pérez for his actions (several Padres were ejected in their subsequent attempts to hit Pérez). When Pérez was finally hit, by a pitch thrown by the Padres' Craig Lefferts, the first of many bench-clearing brawls began. By the time the game was over, both teams' lineups had been nearly emptied (due to all the ejections on both sides). On October 10, 1995, the Braves clinched the 1995 NLDS the 1st team to win a Division Series since the NLDS format in the playoff system began that same year. They defeated the Colorado Rockies 3 games to 1, with the decisive win at home. On October 28, 1995, the Braves clinched the 1995 World Series by defeating the Cleveland Indians, 1–0, on a one-hit, 8-inning performance by pitcher Tom Glavine. The title was the Braves' first World Series championship in Atlanta, making one title in each of the three cities in which they have resided (also Boston and Milwaukee). September 23, 1996 marked the stadium's final regular season game as the Braves played host to the Montreal Expos. Atlanta won the game 3–1 and clinched the NL Eastern Division title in the process. The Pittsburgh Steelers and Minnesota Vikings played the first NFL preseason game on August 14, 1965. On September 11, 1966 the Atlanta Falcons played their first game in the stadium and lost to the Los Angeles Rams 19–14. Sounds Incorporated 1965 US Tour — — This is the band's only concert in Atlanta. May 4, 1973 Led Zeppelin — 1973 North American Tour 49,233 — It was estimated that of the 49,233 people in attendance, about 16,000 of them sat on the field making it the largest single musical performance in the history of the state. In February 1966 Vietnam War supporters held a prayer rally that featured Dean Rusk as its keynote speaker. The stadium hosted a round of the AMA Supercross Championship 1977–1986 and 1989–1992. The stadium was relatively nondescript, one of the many multi-purpose stadia built during the 1960s and 1970s, similar to Veterans Stadium, RFK Stadium, the Astrodome, Three Rivers Stadium, Busch Memorial Stadium, Oakland–Alameda County Coliseum and Riverfront Stadium. As was the case for every stadium that used this design concept, the fundamentally different sizes and shapes of baseball and football fields made it inadequate for both sports. In the baseball configuration, 70% of the seats were in foul territory. In the football configuration, seats on the 50-yard-line—normally prime seats for football—were more than 50 yards (46 m) away from the sidelines. One unusual feature of this stadium is the fact that, unlike most multi-purpose stadiums – where the football field was laid either parallel to one of the foul lines or running from home plate to center field – the football field here was laid along a line running between first and third base. Oakland Coliseum has a similar configuration. Thus, a seat behind home plate for baseball would also be on the 50-yard line for football. The stadium was refurbished for the 1996 season prior to hosting the Olympic baseball competition. Unlike similarly designed outdoor stadiums—such as Riverfront Stadium and Busch Memorial Stadium—Fulton County Stadium always had a natural grass surface. However, for many years it was notorious for its poor field conditions. Until 1989, it didn't have full-time groundskeepers. Instead, it was tended by a municipal street-maintenance crew. Due to the elevation of the Atlanta area (situated at the foothills of the Appalachian Mountains), the stadium boasted the highest elevation in baseball when it opened, at 1,050 feet (320 m) above sea level. It retained this distinction for 27 seasons, until the expansion Colorado Rockies entered the National League in 1993. The elevation and Southern summer heat made it favorable to home run hitters, resulting in the nickname "The Launching Pad." ^ a b c d e f g Fenster, Kenneth R (August 4, 2006). "Atlanta–Fulton County Stadium". newgeorgiaencyclopedia.org. Georgia Humanities Council and the University of Georgia Press. Retrieved June 18, 2012. ^ a b c "New Atlanta Stadium to Stop Rubbernecking" (PDF). Modern Steel Construction. V (1): 10–11. 1965. ^ "Atlanta–Fulton County Stadium". Ballparks.com. Munsey & Suppes. April 2007. Retrieved June 22, 2012. ^ "Atlanta begins park construction". Lewiston Morning Tribune. Idaho. Associated Press. April 16, 1964. p. 12. ^ "Atlanta has long tradition of winning baseball teams". Lewiston Morning Tribune. Idaho. Associated Press. November 12, 1964. p. 19. ^ "Dixie-style welcome due tonight when Braves dedicate new stadium". Rome News-Tribune. Georgia. UPI. April 9, 1965. p. 10. ^ Gray, Jim (February 12, 1975). "Fulton County Gets Name on Stadium". The Atlanta Constitution. p. 12A. ^ "Ballpark history". Major League Baseball Advanced Media. Retrieved June 19, 2012. ^ Arrington, Marvin (2008). Making My Mark. Mercer University Press. p. 167. ^ "Georgia State buys Turner Field, will convert it for football". ESPN. Associated Press. November 9, 2016. Retrieved November 9, 2016. ^ "ESPN: WORLD SERIES 100th ANNIVERSARY". espn.go.com. ^ "1996 Atlanta Braves Schedule - Baseball-Reference.com". Baseball-Reference.com. ^ "2015 AMA Supercross media guide" (PDF). Amasupercross.com. Retrieved July 12, 2018. ^ Reilly, Rick. Peach State Lemons. Sports Illustrated, October 3, 1988. ^ "Aerial photograph of stadium" (JPG). Stadiumsofprofootball.com. Retrieved July 12, 2018. ^ 1996 Summer Olympics official report. Volume 1. p. 539. ^ 1996 Summer Olympics official report. Volume 3. p. 450. ^ "Atlanta Stadium Opens April 9". The Gadsden Times. March 14, 1965. p. 23. Retrieved August 19, 2013. ^ Speer, Ron (April 3, 1966). "Dixie Awaits Big League Bow". The Tuscaloosa News. Associated Press. p. 13. Retrieved August 19, 2013. ^ "1969 Atlanta Braves". 1969 Baseball Replay. Retrieved August 19, 2013. ^ "Site of 1972 All–Star Game". Star-Banner. Ocala. June 14, 1972. p. 3D. Retrieved August 19, 2013. ^ "Atlanta 'Salutes Aaron' in Monday Extravaganza". Spartanburg Herald-Journal. Associated Press. April 7, 1974. p. B6. Retrieved August 19, 2013. ^ "Stadiums of 1977". The Baseball Times. 1977. p. 5. ^ Smith, Chris (June 26, 1980). "Bag of Lemons". The News and Courier. Charleston, South Carolina. p. 1D. Retrieved August 19, 2013. ^ "Braves Playoff Tickets Almost Gone". The News and Courier. Charleston, South Carolina. Associated Press. October 6, 1982. p. 4D. Retrieved August 19, 2013. ^ Chick, Bob (June 15, 1983). "Fans Could Love This Kind of Stadium". Evening Independent. St. Petersburg, Florida. p. 1C. Retrieved August 19, 2013. ^ "National League". Orlando Sentinel. June 2, 1985. p. C7. Retrieved August 19, 2013. ^ "Braves Looking to Draw 50,000 for Big July 4th". The Atlanta Journal-Constitution. July 4, 1986. p. E7. Retrieved August 19, 2013. ^ "Braves vs. Phillies". The Atlanta Journal-Constitution. April 7, 1987. p. E5. Retrieved August 19, 2013. ^ "Braves Sellouts Are Rare". The Atlanta Journal-Constitution. July 11, 1990. p. E2. Retrieved August 19, 2013. ^ "On Deck: Braves vs. Giants". The Atlanta Journal-Constitution. April 9, 1992. p. E8. Retrieved August 19, 2013. ^ "Home of the Braves". The Atlanta Journal-Constitution. November 5, 1995. p. E11. Retrieved August 19, 2013. ^ "Ballpark Blase: Fans Cool to Braves". The Atlanta Journal-Constitution. April 24, 1996. p. C1. Retrieved August 19, 2013. ^ a b c "Falcons Believe They Can Win". The Miami News. Associated Press. October 11, 1966. p. 3C. Retrieved August 19, 2013. ^ "Falcons Need a Victory". The Gadsden Times. Associated Press. October 29, 1978. p. 19. Retrieved August 19, 2013. ^ "Falcons-Redskins Game a Sellout". The Atlanta Journal-Constitution. October 31, 1985. p. E3. Retrieved August 19, 2013. ^ "Owners: Attendance Will Improve". The Atlanta Journal-Constitution. October 12, 1987. p. D7. Retrieved August 19, 2013. Wikimedia Commons has media related to Atlanta-Fulton County Stadium. This page was last edited on 21 January 2019, at 17:04 (UTC).